Mix the chopped cheese, ham and pineapple in a medium jar. Begin to stuff empanadas. Place a bit of the mixed cheese, ham and pineapple on each disc center. Use a baker's brush and paint each disc edges with the egg white. Fold the discs and seal the edges using a fork. Using the same brush, paint the empanadas top with the beaten egg yolk, to give them a golden color when you bake them. Refrigerate the empanadas for a half an hour, to help them seal. Bake the empanadas for 20 minutes or until golden brown. To prevent the filling from coming out through the edges, brush them with egg white before sealing them, and let the empanadas stand in the refrigerator for at least half an hour before putting them in the oven. Empanadas are among my favorite dishes, is one of those things you crave every now and then. 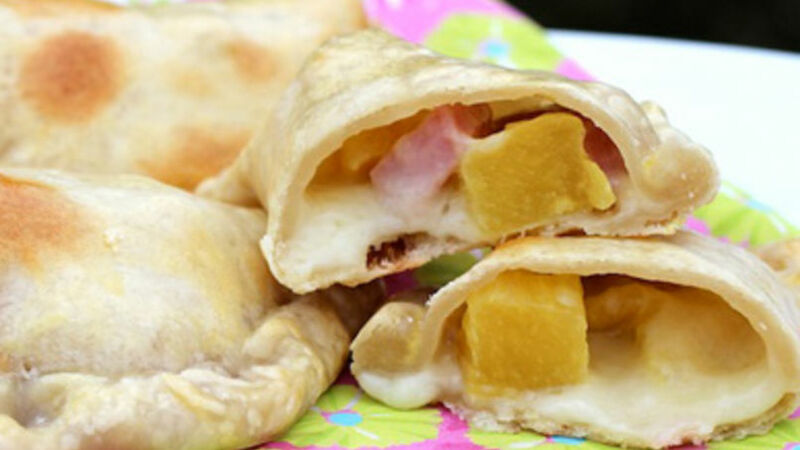 Each time I have a party at home, my guests know there will be at least two different kinds of empanadas in the menu. I always make my traditional Colombian Empanadas and any other kind I'm craving at the time. There is a great variety of fillings for empanadas, even though the majority of them are delicious, I have to admit the Hawaiians are among my favorite ones. I love the flavor and textures contrast from the cheese, pineapple and jam. Today I want to share with you an easy-to-make empanada you can prepare for your family and friends. I hope you enjoy my Hawaiian Empanadas the same way my family and I do. ¡Buen provecho!